EghtesadOnline: Iran’s nuclear chief says progress in efforts by the European Union to facilitate trade with the country despite US sanctions would be an “encouraging” sign that can help keep the trust between Tehran and Europe alive. “I hope that they will take this step because this is an encouragement and will help keep the trust that we worked so hard to build between the two sides. 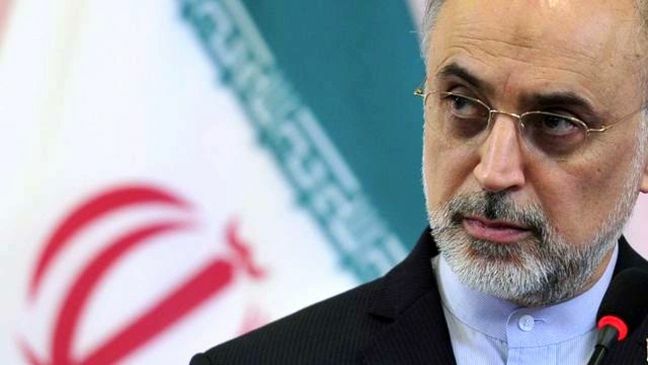 Otherwise, we will be losing the trust and once the trust is lost, everybody will be a loser,” Ali Akbar Salehi, the head of the Atomic Energy Organization of Iran, told IRNA in remarks delivered in English, which were published on Sunday. The European Commission has said it is seeking to launch “very soon” a special purpose vehicle to help European companies bypass renewed US sanctions on Tehran, with three European diplomats saying the official unveiling could come as early as Monday, Bloomberg reported. Progress has been slow in developing the SPV, a key element of EU’s effort to keep Iran from quitting the Joint Comprehensive Plan of Action, the 2015 accord to constrain the nation’s nuclear activities in exchange for sanctions relief. The US pulled out of the deal in May and has since reimposed sanctions, according to Financial Tribune. Salehi lamented that “lately developments have not been very encouraging” but hoped that the ongoing efforts will yield positive results as Iran does not want to see the deal signed between Iran and world powers unravel. “Before it is too late, Europeans, in particular, should fulfill what they have promised. Otherwise, I am afraid that future developments will not be conducive neither for us nor for them or even for other participants of JCPOA,” he said, adding that Europe should take this as a message. The EU, led by France, Germany and the UK, has struggled to find a government willing to host the vehicle, which risks drawing criticism from the American administration. Still, EU foreign policy chief, Federica Mogherini, had said in December that the SPV would be established by the start of 2019. Mogherini’s spokeswoman, Maja Kocijancic, said on Thursday that the SPV preparations are “at an advanced stage”. “We should win this battle and we can only win it together. Otherwise, it will become a battle already lost and certainly this will not be in the interest of the Europeans, specifically if we notice that they look at JCPOA mainly from the perspective of security,” he said. Salehi was referring to the fact that the EU has branded the accord “a key pillar for European and regional security”, but has so far failed to secure Iran’s economic interests under the deal. “There is no credible peaceful alternative to JCPOA,” Salehi said, adding that the International Atomic Energy Agency has verified Tehran’s compliance with the nuclear agreement in multiple reports.